Neighborhood Medical Center will be hosting our monthly Healthy Happy Hour at the Richardson-Lewis Center (872 W. Orange Ave. Tallahassee, FL 32310). 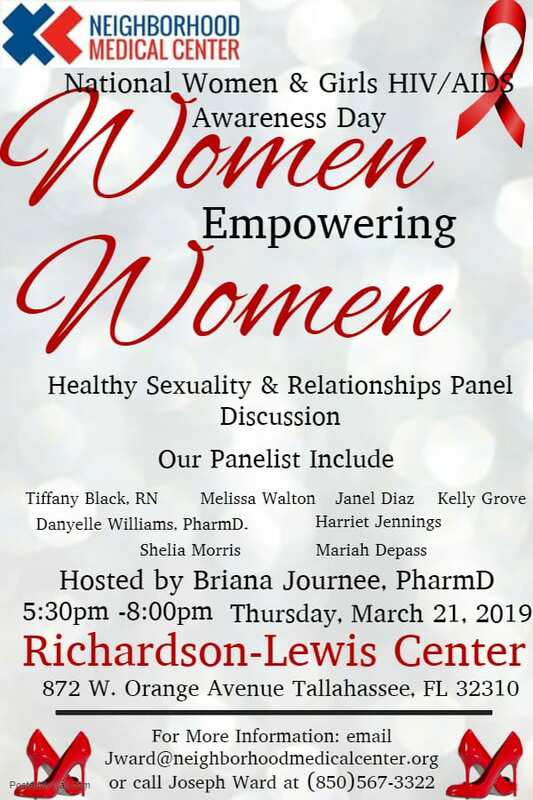 This event will take place on Thursday March 21, 2019 from 5:30pm-8:00pm. This month we are dedicating our Healthy Happy Hour to honoring National Women & Girls HIV/AIDS Awareness Day. We will be holding a panel discussion composed of seven prominent women representing various aspects of HIV prevention. Dr. Briana Journee will be our host for this event. Please come out and help Neighborhood Medical Center spread the word to patients, family, friends, and community members as we learn new ways to empower ourselves and our community.